Helping your child with their choice of university can mean Open Day visits the length and breadth of the country. Plus visits and stays when your child is studying there. Our ‘Uni Visits’ pages focus on university towns and cities all over the UK, offering local expertise on where to stay, eat and what to do to get the best out of your time there. Lancaster University is situated 3 miles from the centre of Lancaster. It’s a small city with a big story; compact, easy to get around, perfect for short breaks, with a fascinating history and hundreds of stories to tell. From its first incarnation as a Roman fortress, to its rows of unspoilt Georgian terraces and pretty squares, the majestic Castle (The Queen’s only castle in the North), Priory and Ashton Memorial – each contributes to the city’s distinctive and photogenic skyline, set against a backdrop of Morecambe Bay and the distant Lake District hills. The Borough – lovely accommodation alongside a CAMRA Quality pub. Cheers! You can be sure of a warm welcome in Lancaster. Choose a fabulous boutique guesthouse or stay in style in an award-winning hotel. Alternatively, retreat to a cosy self-catering cottage nestled in the surrounding picturesque countryside in and around the Forest of Bowland. As soon as you’re welcomed in the balconied Reception Lounge with its open fire and shown to the relaxed elegance of one of its 99 bedrooms, you know that the Lancaster House Hotel is a place to savour the good things in life. With an acclaimed restaurant, leisure club and beauty salon you’re ensured a relaxing break just a short walk from the university campus. Lancashire Tourism Awards Large Hotel of the Year 2014. Winner of VisitEngland Best B&B, The Ashton is Lancaster’s first and only 5 Star place to stay. A handsome Georgian manor house with 5 beautifully designed rooms, set in an acre of gardens, just a short walk from Williamson Park and the Ashton Memorial. Luxurious, relaxing and in a quiet location on the city outskirts, it’s one of the UK’s most desirable places to stay. Originally the site of the old Toll House and the gateway to the city, this imposing Victorian listed building has a wealth of architectural features and 28 individual, high quality rooms. Part of the Thwaites Inns of Character group, this inn’s Grill on the Bridge offers quality Lancashire produce served throughout the day with finest Thwaites cask ales on tap. Located on one of Lancaster’s most impressive Georgian squares, Dalton Square, The Borough offers nine beautiful contemporary bedrooms spread over two floors accessed via its own entrance next to this award-winning, CAMRA 2014 Quality Pub of The Year. Delicious locally sourced food is served all day every day in the dining room, pub and courtyard garden. The Borough also boasts a microbrewery on site and a bar offering 8 cask ales, 3 lagers, over 20 wines plus a wide variety of spirits and malts. 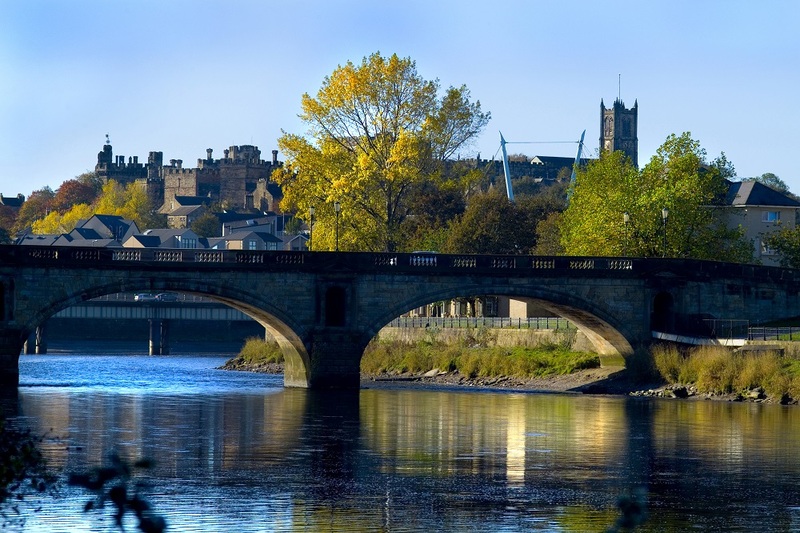 Relax in one of Lancaster’s wealth of cafés, independent coffee shops and restaurants. The smell of roasting coffee permeates the air as you wander these historic streets and quirky alleyways and you’re never far from locally-brewed real ales, home-made soups and cakes or locally caught seafood, in particular the world renowned and by-Royal-approval Morecambe Bay Shrimps. For the perfect evening, dine in one of the city’s wide choice of restaurants, many celebrating Lancashire’s abundance of quality local produce. A characterful pub (with the bonus of rooms) on the banks of the River Lune, the Wagon & Horses serves top quality, wholesome dishes, made with local produce. Perfect after a walk along the river or sightseeing around the Castle or Maritime Museum. Head there in the evening and more often than not, you’ll be welcomed by live music or entertainment. Located on St George’s Quay, this 18th century converted warehouse is delightfully modern and chic. The menu changes daily but on Wednesdays try their Steak & Mussels, on Thursdays its Champagne & Lobster, Sunday and Monday get Simply Squiffy with two courses and bottle of wine for £25pp. Passionate about using only the best ingredients, with a sprinkling of fun; QSF delivers quality and ambience with French flair and Lancashire warm hospitality – putting the ‘Oooh La La’ into Lancaster. Less than a 30 minute drive and you can be on the Morecambe coast enjoying the delights of the 1930s iconic Midland Hotel. This art deco masterpiece, which has been lovingly restored, is a must-see destination for visitors to this stunning stretch of Lancashire coastline. Enjoy a superb afternoon tea overlooking the panorama of Morecambe Bay and watch the tide roll in across seemingly endless sands, or linger over a glass of wine in the Rotunda bar before dinner in the Sun Terrace restaurant, as the sun sets spectacularly over the Bay. If you’re lucky enough to be staying, take the elegant staircase to one of the hotel’s 44 boutique-styled rooms and get the best views of the Eric Gill (English sculptor 1882-1940) mythological and marine-inspired artworks that adorn the grand foyer. Visit Lancaster Castle (Castle Tours daily) and the city’s museums, learn about its Roman and maritime history and in particular the stories linked to the Castle’s continuing role as a county court; where infamous criminals, martyrs and the Lancashire witches met their fate. The Castle is The Queen’s only castle in the north, part of the Duchy of Lancaster and 2015 marks the 750th anniversary of the Duchy inheritance, which give the reigning monarch the title of Duke of Lancaster. Visit the Storey Institute, close to the Castle entrance, where you’ll find the excellent Visitor Information Centre for expert advice on attractions and events taking place during your stay – there’s also a great café. It’s then just a short walk to the Judges Lodgings, Priory, City Museum or Maritime Museum. Stroll the meandering towpaths of the canal or along St George’s Quay, marvelling at the Georgian architecture which lines the banks of the River Lune, the area around Castle Hill and the squares that remain social hubs to this day. Make sure you visit Atkinson’s coffee roasters and tea merchants on China Street, to stock up on Lancashire-roasted coffee from all over the world. The smell is just amazing – and of course it’s even better in a cup with a slice of cake – try next door at The Hall or at The Music Room, on Sun Square, where a cup of coffee in this cute little suntrap away from the main shopping street is a little slice of coffee heaven. Explore the secret paths of Williamson Park and discover its hidden follies and stunning Edwardian designed butterfly house and the dominating, iconic Ashton Memorial -‘Lancashire’s Taj Mahal’, a memorial to love and Lord Ashton’s tribute to his departed wife. Discover the open spaces and strong design of the two university campuses and find out how these seats of learning have influenced the city over the years. Lancaster has over a dozen regular open music sessions every week covering acoustic, bluegrass, funk and soul, jazz, pop and rock (and, yes, even ukulele). The award-winning annual Lancaster Music Festival (October) celebrates this music-loving city and attracts over 30K visitors – so book early. It’s also a place where artists, writers and performers can express their creativity at The Dukes (Lancashire Cultural Venue of the Year 2013) or The Grand Theatre and The Storey Institute. Each summer Williamson Park is transformed by The Dukes into the country’s largest walkabout theatre, for performances in the park that see families returning every year for this magical outdoor experience. Visit on a particular dark November weekend and watch the streets spring to life, as the city celebrates Light Up Lancaster, a fabulous free light and art event for all the family topped by a spectacular firework display that illuminates the Castle and city skyline. Discover one of England’s Heritage Cities. Lancaster is a small city with a big story.